The passenger compartment remained stable in the frontal impact. Stiff structures in the dashboard presented a potential hazard to the femurs of the driver and passenger. Maximum points were scored in the side barrier test and adequate protection was provided to the chest in the side pole impact. Protection provided against whiplash injury was rated as marginal. The i20 scored maximum points for its protection of the 1½ year old in the frontal and side impacts, based on dummy readings. Forward movement of the 3 year old's head was not considered excessive in the frontal test. The passenger airbag can be disabled to allow a rearward facing child restraint to be used in that seating position. However, information provided to the driver regarding the status of the airbag is not sufficiently clear. The presence of ISOFIX anchorages in the rear outboard seats is not clearly marked. Most of the bumper provided good protection to pedestrians' legs, as did most parts of the bonnet edge. The protection offered by the bonnet was good in most areas likely to be struck by a child's head but was predominantly poor in those areas where an adult's head would hit. 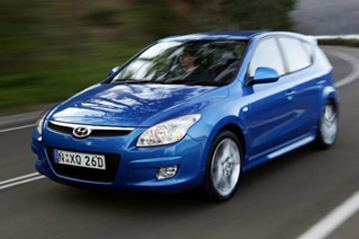 Some variants of the i20 have electronic stability control as standard equipment and some have it as an option. The great majority of cars sold are expected to be fitted with ESC as standard. A seatbelt reminder system for front and rear seats is standard equipment.